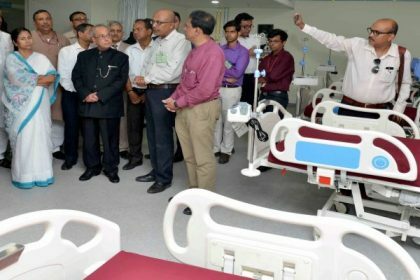 The President of India, Shri Pranab Mukherjee inaugurated the Indian Institute of Liver and Digestive Sciences at Sonarpur, South 24 Parganas, West Bengal. Speaking on the occasion, the President said that although big cities have super-speciality hospitals, modern state-of-the art healthcare facilities is yet to reach people residing in lakhs of remote villages in the country. The country also needs institutions where healthcare research is pursued with a scientific and analytical mind. He expressed hope that the Indian Institute of Liver and Digestive Sciences will benefit citizens living in Eastern and North-east India and also a large part of Eastern Uttar Pradesh .He stated that this Institute will enable people to seek treatment related to gastro-intestinal diseases at an affordable price in this part of the country. An attitude to serve the people is required in addition to good medicines and advanced healthcare facilities. The practical truth is ‘A smiling face can cure half the disease’.